Mirage is the hotel on the Strip with the theme of Polynesia. Outside the Hotel stands an volcano. Every night you can see the volcano get an outbreak. The Hotel has over 10 restaurants and are famous for their big pool with laguns. 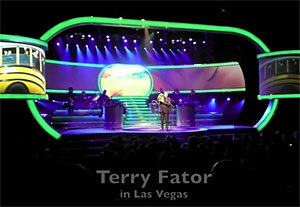 The "America's Got Talent" winner brings to life a lot of different characters as Emma Taylor, the little girl with the big voice and lounge singer Monty Carlo., världsstjärnor as Garth Brooks, Dean Martin, Aretha Franklin, Lady Gaga and more, Terry Fator: Voice of Entertainment is a one-of-a-kind experience, only at The Mirage. 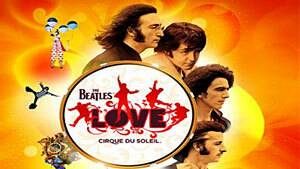 A musical experience for all of you Beatles fans. With a set of 60 performers they mix Beatles wonderful songs and texts to a super show. Outside the Mirage hotel, you'll find the Volcano. Since the hotel's opening in 1989, the volcano have been found here. At specific times during the evening the volcano is breaking out with a fantastic sight of water and light. It was Siegfried & Roy that made the white tigers world known with their spectacular shows. The shows are not here anymore but the white tigers can be seen on the Mirage - Secret Garden & Dolphin Habitat. Mirage was at the opening one of the world's most expensive hotel. It had cost $ 600 million to build. Mirage has 31 floors high. To be able to run the Mirage was said to have to bring in $ 1 million per day in revenues to pay off their loans, it went faster than expected and after about 18 months the loan was payed off. Mirage is said to be something of a salvation for Las Vegas, which had seen a down in the tourist flow. Many had begun to go to Atlantic City to play. Now it was time to get more tourists to Las Vegas. With the Mirage and its nice hotel, its security and its shows, Las Vegas now came back to its former star potential. Between 1990 and 2003 Mirage was the scene of Siegfried & Roys spectacular show with wild animals. They were world famous for its white tigers. Mirage was also one of the casinos that was "robbed" by Danny Ocean and his team in the movie "Oceans Eleven". Casino games include Pai Gow, Pai Gow Poker, Let It Rid, Blackjack, Craps, Roulette, Baccarat, 2.250 slot machines, Caribbean Stud Poker, Poker, Keno, Megabucks and Super Megabucks.There are also poker room.